One of the most important books ever published on European regional cooking is available again. 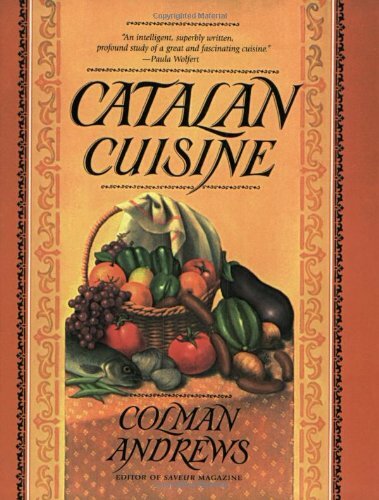 Catalan Cuisine is the definitive guide to the food, wine, and the customs of Catalonia, a province of northeast Spain. Colman Andrews is the former editor-in-chief of Saveur magazine and an internationally acclaimed food and travel writer. He is the author of numerous classic and definitive cookbooks and has written extensively for major newspapers and food and travel magazines including Saveur, Food & Wine, Bon Appétit, Metropolitan Home, the Los Angeles Times, and many more. A leading authority on the food and culture of Spain’s Catalonia region, Andrews has also been a restaurant critic since 1972. Andrews is listed in “Who’s Who of Food and Beverage in America,” and is a member of the James Beard Foundation, a James Beard Foundation Awards Judge, and a recipient of five awards from the foundation, including the M.F.K. Fisher Distinguished Writing Award. He is the recipient of the International Association of Culinary Professionals’ Bert Greene Award for magazine food journalism. He is also a member of Share Our Strength’s Culinary Council, and gave the keynote address at the 2005 Oxford Symposium on Food & Cookery.